Throughout his life Thomas Kinkade shared his joy and used his paints in support of hospitals, schools, and humanitarian relief. Though the recipient of countless awards and honors, it was Thom's profound sense of purpose that his art was not just an accessory, but also a ministry, that continues on as his legacy. From custom images that were sold for The Salvation Army, Hurricane Katrina relief, Rotary International, to donations that now grace the halls of St. Jude's Children's Research Hospital, the White House, The Vatican, and Britain's Tate Museum, Thom raised hundreds of thousands of dollars over his lifetime for charity. 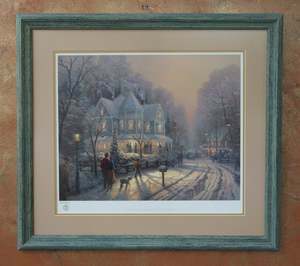 Thomas Kinkade the artist was also a devout and loving family man. It was this devotion for his family that inspired him to add symbols of his love to his artwork. Numerous paintings contain hidden "N's" representing Thom's lovely wife Nanette and many other paintings include the numbers 5282 as tribute to their wedding date May 2, 1982. Thom's four daughters were also included in his artistic process- after the birth of each of his daughters, Thom painted adoring images in each of their namesake; Evening at Merritt's Cottage, Chandler's Cottage, Winsor Manor and Everett's Cottage.